This is particularly relevant when it comes to analysing how work-based hours are spent and the prioritisation of tasks in order to maximise personal efficiency in the workplace. Yet would it be fair to say that it is also a juggling act of various demands of perhaps study, social life, employment, family, and personal interests and commitments with the finiteness of time. Using time effectively gives a person “choice” on spending/ managing activities at their own pace and expediency. Viewing it more holistically, it would appear then that life works from a place of balance and flow because when a person is unable to manage their time it may eventually lead to, or be a causation for becoming stressed. It is then an activity with the goal to maximize the overall benefit of a set of other activities within the boundary condition of a limited amount of time, as time itself cannot be managed because it is fixed. Time management may be aided by a range of skills, tools, and techniques used to manage time when accomplishing specific tasks, projects, and goals complying with a due date. 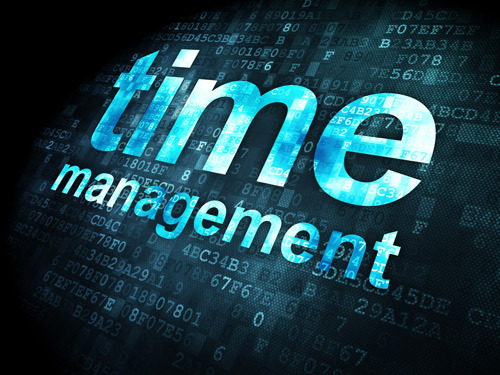 A time management system is a designed combination of processes, tools, techniques, and methods. Time management is usually a necessity in any project development as it determines the project completion time and scope. Sometimes creating an environment for effectiveness refers to having a tidy office or home for unleashing creativity, and the need to protect “prime time”. Literature also focuses on overcoming chronic psychological issues such as procrastination or suggests that an inability to mange time effectively may result from ADHD (Attention Deficit Hyperactivity Disorder), or ADD (Attention Deficit Disorder). The latter particularly can lead to a sense or a feeling of underachievement, difficulty getting organised, trouble getting started, many projects going simultaneously and trouble with follow-through. Sometimes the focus is on the prefrontal cortex which is the most recently evolved part of the brain. This controls the functions of attention-span, impulse-control, organisation, learning from experience and self-monitoring, among others. It can also be argued that changing the way the prefrontal cortex works is possible and offers a solution. Time Management strategies are often associated with the recommendation to set personal goals. Each group is then ranked in priority by choosing to, say, place all “B” items as either “A” or “C”. Task lists are often diarised and tiered. The simplest tiered system includes a general to-do list (or task-holding file) to record all the tasks the person needs to accomplish, and a daily to-do list which is created each day by transferring tasks from the general to-do list. An alternative is to create a “not-to-do list”, to avoid unnecessary tasks. Often a daily list of things to do numbered in the order of importance, and done in that order, one at a time as daily time allows, can be most helpful. Another way of prioritising compulsory tasks (group A) is to put the most unpleasant one first. When it’s done, the rest of the list feels easier. Groups B and C can benefit from the same idea, but instead of doing the first task (which is the most unpleasant) right away, it gives motivation to do other tasks from the list to avoid the first one. Change is hard, and most daily life patterns are deeply ingrained habits in us all. In fact certain unnecessary factors that affect time management are habits, lack of task definition (lack of clarity), over-protectiveness of the work, guilt of not meeting objectives and subsequent avoidance of present tasks, defining tasks with high expectations than their worth (over-qualifying), focusing on matters that have a positive outlook by appearance without vigilance of its input to personal needs, tasks that require support and time, sectional interests and conflicts, etc. to name but a few. Whether you get stressed with your time management, or end up procrastinating over an ingrained habit, I can offer you the space and support required whilst managing your issues and to help you identify where this all comes from. As part of this I may be able to help you break simple practical tasks down in to manageable steps or chunks which are attainable. If I can help you make a change in how you manage your time so that you can evolve to use this more effectively and productively, please contact me by emailing belinda@breathofchange.org.uk or calling 07973 410375 / 02088732843. I operate from clinics in both Epsom in Surrey and Crawley in West Sussex.